Rick Rodgers is one of the most versatile professionals in the food business. Through his work as a cooking teacher, food writer, cookbook author, freelance cookbook editor, and radio and television guest chef, his infectious love of good food reaches countless cooks every day. He is the author of more than forty cookbooks on a wide range of subjects including the best-sellers Thanksgiving 101 and Fondue, and IACP Cookbook Award nominees, Kaffeehaus and The Carefree Cook. 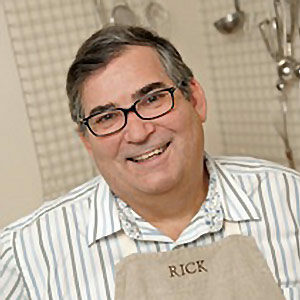 Arbiter of taste Williams-Sonoma has chosen Rick to write many titles in its various cookbook lines. Rick’s recipes have also appeared in Food & Wine, Men’s Health, Cooking Light, and Fine Cooking, and he is a frequent contributor to Bon Appétit. Burnished skin. Juicy meat. An insanely come-hither aroma that pervades the house. All this can be yours for supper. And it’s so simple to toss it together. Parmesan toast. Cheesy toast. Same thing. Just depends on the situation and the company you keep. No judgment passed here. A slinky little something to slip into, one that comes together easily and elegantly, impresses guests and family, works anytime of day, and sullies but a single skillet. These glazed cider doughnuts are certain to conjure memories–real or imagined–of crisp autumn mornings, roadside farmstands, and grease-stained paper bags full of similar piping hot beauties. Everything you remember from childhood–slathered with butter, sprinkled with cinnamon, and, if you were lucky, drizzled with honey. This lamb tagine, fragrant with spices and served, is ladled into a roasted pumpkin for a spectacular presentation.